I am nowhere near a coffee aficionado, I only drink coffee at work or when I go outside. I drink tea at home. Lately I have been having some coffee drinking urges at home. So I am looking for a single serve coffee maker (wife hates coffee) that is fairly easy to use. Looking for other suggestions and comments. Thanks. If your not into coffee that much but want a single to 2 serving size. Get a French press. It’s way better coffee than a pour over coffee maker. And it’s way less expensive. I grind my own bean and use French press. It’s so much tastier than pour liquid over a paper filter that removes all the oils and flavonoids from the beans. Just my opinion. (11-23-2017, 04:59 AM)Ramjet Wrote: If your not into coffee that much but want a single to 2 serving size. Get a French press. It’s way better coffee than a pour over coffee maker. And it’s way less expensive. I'd never heard of the Moccamaster, and it's probably fine, but I would add to the above recommendation. French press is wonderful. For a single cup, though, I would highly recommend an Aeropress. Heat up water, grind some beans, and you'll have great coffee in about two minutes with very minimal cleanup. I've seen coffee houses that offer coffee made with an Aeropress. Reading shaving forums is really educational. Nice size!! I have the 8 cup Technivorm Moccamaster. Guessing about 15 years old and made 7,500 pots of coffee. If the Technivorm ever dies, the smaller size could now be on the top of my list. I occasionally use a french press and Eva Solo - I use the Technivorm to heat the water - directly or indirectly. Most coffee sites rate the Technivorm Moccamaster at or near the best available. As mentioned above, there are excellent $25 options excluding scales and electric kettles to heat the water to the correct temp. A coffee purist would consider many options are better than the electric brewers (same as DE shaving purist and electric razors). The Hario V60 looks like one of those pour over methods similar to chemex, but much less expensive. The amazon reviews of the V60 are near 5 stars (1,555 reviews) and fakespot graded the reviews with an A. Like you, I don't have any coffee making device at home and only drink at work or a stop by starbucks. If I were to get something for the home I personally would follow the recommendations here - french press or the pour over. Good luck! One thought about the pour over method is you'll probably want a hot water kettle with a controllable pour - something with a goose neck should work well. A french press is hard to beat in my book. I use one eery day. I have not used a Technivorm but they have been highly regarded for a long time. I'm also the only coffee drinker in my household and not a connoisseur so small batches and easy cleanup are qualities I appreciate. I used a Clever coffee dripper, a Hario slim manual grinder and a Mira kettle for a year plus and it was perfect. The coffee tasted great to me. This past birthday I requested some coffee rig upgrades and I have been very happy with them. 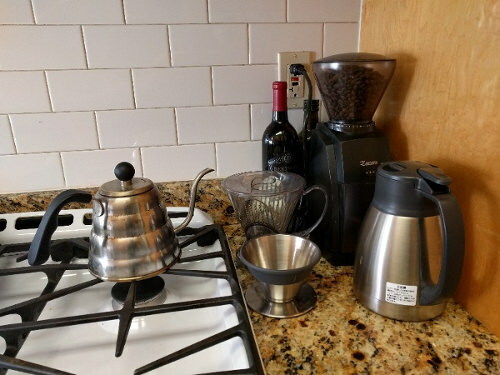 A Baratza Encore grinder, a December Coffee Dripper, and a Zojirushi thermal carafe. My routine takes about 13 minutes to boil the water and perform the pour over. It makes 4 cups in the carafe and stays hot for 5+ hours covering breakfast and lunch hours. Could shave off a few minutes if I made less cups.